Ce KF2, ce sera ma prochaine commande Christophe. C'est vraiment une belle évolution du KF et du Cougar tout simplement. Cougar KF2 reçus ce matin. Il me reste plus qu'a le monter pour le GP de Lyon. Pas mal, c'est vrais qu'en version shorty, ça recule bien l'ensemble de la transmission et ça laisse beaucoup de place pour l'électronique. To fit any Schumacher gear diff is this new 'O' ring seal set. The new range of 'O' rings will improve the seal of the Schumacher gear diff to prevent leakage. Le KF2 c'est quand même un châssis et surtout un train arrière assez différent du KF. Je monte le miens, avec les options (cellule arrière alu. pour passer les amortisseurs derrière, et toutes les fusées en alu.). Mais pour le moment difficile de trouver des setups de KF2 autres que ceux de la notice de montage. merci pour ta reponse, mis a part la courroie option du KF rien d'autre n'est a changer ! car je ne comprends pas comment le shorty peux passer avec la courroie centrale ! C'est simple le tendeur passe du centre à la cellule arrière avec pour résultat de remonter la courroie et de laisser la place pour le shorty. En revanche Dremel obligatoire pour decouper la bavette latérale et " enfiler" le pack. J'ai pu essayer mon auto, sur la piste du GP de Lyon ce week-end. Une superbe piste qui est de loin la plus belle sur la quelle j'ai pu rouler en salle. Mais ce KF2, c'est vraiment impressionnant comme il fonctionne sur ce type de piste !!! on peut en faire ce que l'on veut pour un peut que l'on ai les doigts. Ca vire a plat, ça saute a plat, et même avec un pilotage agressif, la voiture ne vous surprend jamais. J'ai roulé en version shorty, avec un setup, proche de celui de boite et déjà ça marche super bien. Ma seule casse du week-end (en finale, malheureusement !! ), un axe de roue avant suite a une mauvaise réception de bosse. Mais encore une fois, Schumacher nous a sortie la, un superbe buggy !!! For the Cougar KF2, optional rear toe in blocks. These can be used to give you the option of using 4 degrees or 1.5 degrees rear toe in compared to the kit 2.5 or 3 deg. These will mainly be used in more extreme low grip or high grip conditions. To tune the stiffness at the front end of the car, a front top deck. This can be used where traction is very high and the car needs more stability. The top deck incorporates a fan mount, so you can keep the motor cool under high load conditions. This is not my photo someone at the track snapped it when i was away from my pit. Kit low grip dispo. Je précise mid motor, à priori moteur "collé" à la cellule et pack devant, chassis carbone. Je n'ai pas vu de photos avec l'electro dessus pour l'instant. The world of 2WD Off Road is constantly on the move. With differing track surfaces, high, medium and low grip, the nature of a 2WD Off Roader can never stand still for too long! Schumacher Engineers have once again been working hard to provide the best package and are pleased to bring a Mid Motor Conversion for the popular Cougar KF2. 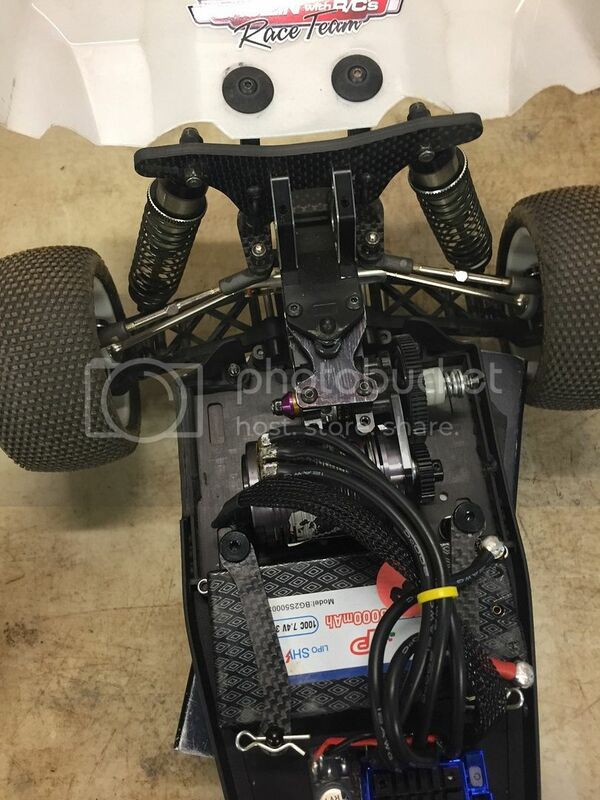 The Mid Motor Conversion means that racing on low and medium traction conditions such as dirt and sandy/dusty astro just got easier. 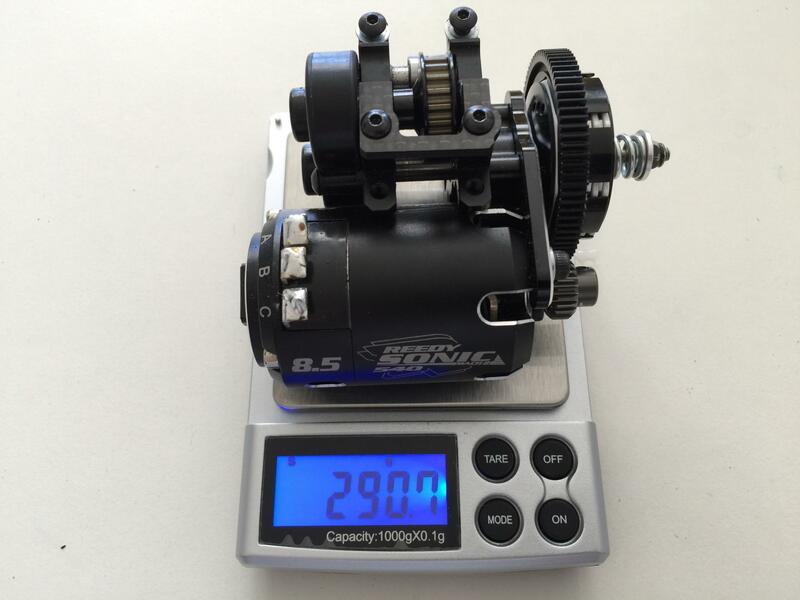 The conversion moves the motor cluster back by 19mm and puts the lipo in front of the motor. The included carbon fibre chassis accepts all motor positions, Standard, Low grip and Mid as well as all lipo layouts. The shift gives the KF2 more rear traction and allows the power to be transmitted easier into forward bite and acceleration. The chassis accepts normal height shorty lipos, to maximise traction on very low grip conditions a low profile lipo could be used such as the Intellect IPCC2S3500V9 or the LCG NOSRAM NR999523. Please note that the body requires a small modification to clear the spur and side gear cover or a modified body is available, part U5133. C'est celui de Michal Orlowski au warm-up de l'euro. Ceci- dit avec un shorty court lrp/nosram, on peut passer le vario dans l'alignement du pack et recentrer les masses vers l'arrière. I'm sceptical on low grip. I guess it depends on what you mean by "low grip". I think this might mean different things to different people depending on what surfaces you typically run on. To someone here in the U.S. low grip means rooster tails on loose dirt but in the U.K. it might mean wet and/or sandy astroturf. Schumacher is specifically claiming dirt surfaces on their product page saying the kit addresses: " low and medium traction conditions such as dirt..." This is obviously good news. The layout looks very close to that of the YZ-2 with the motor maybe a little more forward. The owner of our track just started running a YZ-2 in favor of his RB6 and he adores it. With this kit for the KF2 I am hoping it puts it right there with it. Even if I don't end up running this car as my main buggy I am still thankful for the way it has forced me to learn about setup and vehicle dynamics. Definitely trial by fire. My recent experiment with using the LRP super shorty and moving the ESC back has taught me that the F/R weight ratio is only part of the equation. The car right now is very similar to my B5M in terms of side bite and lateral grip and handling (with way more steering) but it still doesn't have the forward bite, even with 4 degrees of anti-squat running identical tires (swapped over). I get too much wheel spin and if I loosen the slipper to compensate then I'm unable to clear jumps well so it is tough. This is probably why some people on this thread have felt the car feels a little sluggish. I thought some of this might be due to the belt vs gear drive and heavier weight of the car but I think it is probably the traction. If you watch some of the videos from the EOS races with Michael Orlowski driving against other world class pros on carpet you will not notice any problems with sluggishness! In fact, in the race I watched he was clearly the fastest car on the track but Lee Martin just has robotic consistency. I took the motor/trans pod assembly off my car in preparation for the new kit and weighed it. (See attached image). It comes in at 290g. The shorty lipo I have been using weighs about 205g. So by swapping these two things in the layout you are basically shifting around 85g more towards the rear of the car. The upper CF brace seen in the kit is replacing the aluminum side stiffeners from what I can tell so I will consider those to be a wash. My guess is that this change will put the car well into the 62% rear weight range and maybe just get to 63% depending on wheelbase configuration. But now we have the added flexibility of running a lighter battery to further reduce the weight in the front and this will be extremely useful. Some of the batteries referenced on Schumacher's page for the kit are about 155g. That should allow the rear to see even up to 64%. As a bonus the car should only weigh about 1515-1530g with a battery like this coupled with the CF chassis in the kit. This should make stock people happy. during acceleration is going to act on the chassis much further away from the center of mass (towards the rear) than it does with the existing low-grip position. In the low grip position the motor appears to sit very close to where the center of mass probably is on the car. So then you accelerate the downward force the chassis experiences would be like if you put your finger on top of the motor and pushed down. 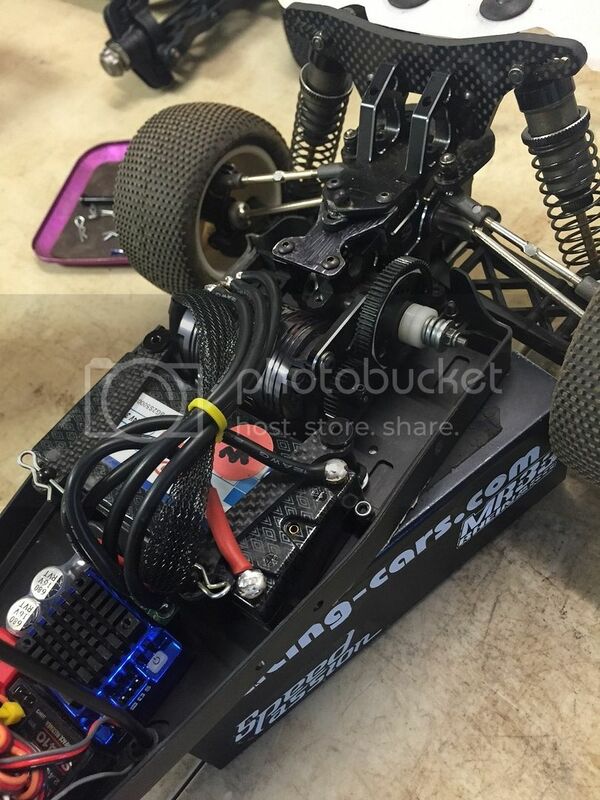 The whole car sits down a little because the motor is close to the center of the car. But now with the motor much further back the force should make the car sit down more during acceleration. And with the added weight in the rear it will make the effect even more pronounced. You should also be able to have more control over the pitch of the car in the air with this change. Equal throttle input will result in more pitch change than before. It is worth mentioning that the current trend in the B5M community is to use a 3-gear transmission on higher traction surfaces. This is because the motor is mounted in reverse and spins clockwise instead of counter-clockwise. This makes the front of the car pitch forward during acceleration instead of rearward and helps keep the car flatter on power in the turns, which adds steering. But you end up giving up some forward bite and most of the cars I have seen run extra weight in the rear to compensate. So the B5M people are trying to get corner speed by sacrificing rear grip with the 3-gear and we are trying to do the exact opposite with this kit for the KF2. Assuming this kit works well I think we are in a much better position for the future as tracks in the U.S. seem to be moving towards higher grip as a general trend. If the grip comes up just move the motor forward to keep the car flatter. This is a much more elegant design solution than turning the motor around and completely changing the vehicle dynamics IMO. And never mind you have to remember to use brake to pitch the car up in the air instead of throttle. That might be fine for Ryan Maefield but for people like me it is a nuisance. Réponse faite en sheakspearien sur rc tech.